It may have been a simple oversight but a recently-posted list of Battlefield 3 digital distributors very conspicuously failed to mention Steam. 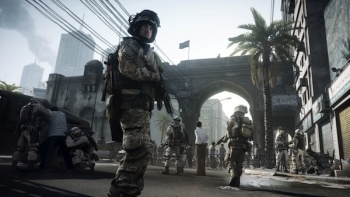 The list of digital distributors who will be carrying EA's upcoming Battlefield 3 has been pulled from the net but while it was up, it was noteworthy primarily for the absence of Steam, which of course is far and away the biggest digital distribution platform is existence for PCs. EA is naturally doing everything it can to pimp Origin, its own online distribution service, but it appears to be aiming at Steam directly with BF3, as other digital retailers like Direct2Drive and GamersGate will still be carrying the game. The current 404 status of the list suggests that it might have been a mistake, but that's a little harder to swallow in light of the kerfuffle over Crysis 2 on Steam that went down a few weeks ago. The game disappeared very suddenly from the service, eventually leading to a vague and convoluted explanation about new business terms imposed by Valve that conflict with Crytek's deal with another distribution service; names weren't named but the assumption is that the offending deal is with none other than Origin. EA's help site offers a bit more insight into the behind-the-scenes action that could be causing all the purse-swinging. "When a download service forbids publishers from contacting players with patches, new levels, items and other services - it disrupts our ability to provide the ongoing support players expect from us. At present, this is the case with only one download service," it says. "While EA offers its entire portfolio to this site, they have elected to not post many of our games." The statement adds that EA hopes to find a "mutually agreeable solution" to the problem soon, but it's not beyond belief that the publisher isn't struggling too mightily to rectify the situation. There's already one high-profile Origin exclusive in the works - The Old Republic - and Battlefield 3 promises to be big enough to attract a lot of gamers who would have otherwise defaulted to Steam. Whether or not that's a smart move remains to be seen, but it sure is an interesting one.